Are you looking for something fun to do this weekend? Look no further! Downtown State College Improvement District has got you covered. Continue reading to discover events happening in and around downtown between Friday, April 5th and Sunday, April 7th. Enjoy! First Friday from 5 – 8pm in Downtown State College. 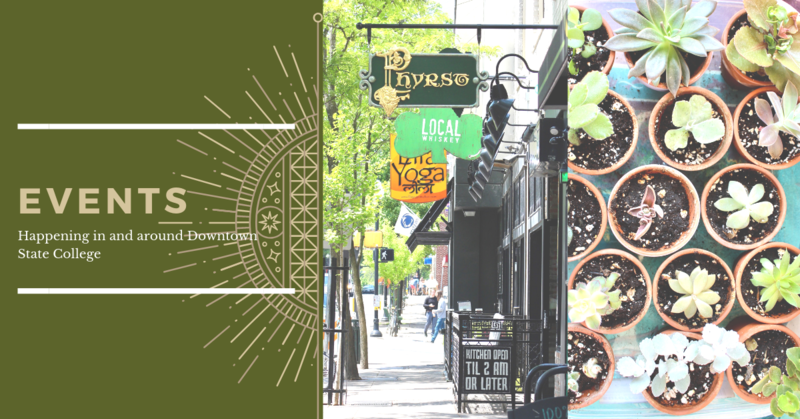 Events being hosted by The State Theatre, Art Alliance Gallery Downtown, Appalachian Outdoors, Downtown State College Improvement District, New Leaf Initiative, The Makery, Woskob Family Gallery, Central PA Dance Workshop, The Expect More Store and Lila Yoga! PSU Women’s Tennis vs. Minnesota at 5pm. Happy Valley Indian Performing Arts Festival 2019 at 7:30pm at The State Theatre. Tickets: Adults – $6.50, Students: $5.50. Presented by The Society for Indian Music and Arts. PreVUE 2019 from 1:30 – 7:30pm at The State Theatre. Ticket prices vary. Presented by Tempest Productions. PSU Men’s Volleyball vs. University of Charleston at 7pm. To Kill A Mockingbird at 7:30pm at Playhouse Theatre. Tickets: $25, PSU Student (with ID) – $12.50. Dr. Andrew Jackson and Friends from 8 – 10pm at Webster’s Bookstore & Café. BYOB. Strayer at 10pm at Doggie’s Pub. Ted & the Hi-Fi’s from 10:30pm – 2am at The Phyrst. PreVUE 2019 from 9:30am – 8pm at The State Theatre. Ticket prices vary. Presented by Tempest Productions. Vintage Pop-Up Shop starting at 10am – 7pm at Webster’s Bookstore & Café. Saturday – Sunday event. Benefits Centre LGBTA Support Network. Saturday Stories Alive at 11am at Schlow Centre Region Library. Drag Show Brunch from 11am – 4pm at Doggie’s Pub. Tickets: $10 in advance, $15 at the door. To Kill A Mockingbird at 2pm at Playhouse Theatre. Tickets: $20, PSU Student (with ID) – $12.50. Preschool Block Party from 2 – 4pm at Schlow Centre Region Library. Country Music with Kick the Footlights from 7 – 9pm at Webster’s Bookstore & Café. Happy Valley’s Got Talent at 7pm at The State Theatre. Tickets: Adults – $28.50, Students/Children – $12.50. PSU Men’s Volleyball vs. George Mason University at 7pm. The Nightcrawlers at 10pm at Doggie’s Pub. Pure Cane Sugar at 10:30pm at Zeno’s Pub. Sunday Music and Vegan Brunch with JT & Andy from 10am – 2pm at Webster’s Bookstore & Café. Vegan brunch served at 10am and live music starting at 12pm. PSU Women’s Tennis vs. Wisconsin at 11am. PSU Women’s Lacrosse vs. Virginia at 1pm. Vintage Pop-Up Shop 10pm – 7pm at Webster’s Bookstore & Café. Saturday – Sunday event. Benefits Centre LGBTA Support Network. PreVUE 2019 from 1:30pm – 7:30pm at The State Theatre. Ticket prices vary. Presented by Tempest Productions. We Love Baby Animals from 2 – 4pm at Schlow Centre Region Library. Stamped Garden Stakes from 4 – 5:30pm at The Makery. Book Release with Michael Don from 4 – 5:30pm at Webster’s Bookstore & Café. Finding Your Roots: The Seedlings at 6pm at The State Theatre. Free admission. Presented by WPSU. PSU Men’s Lacrosse vs. Ohio State at 7pm. PSU Figure Skating Spring Gala from 6:30 – 7:30pm at Pegula Ice Arena. Dollar Hot Dog Night for Penn State graduating seniors from 8pm – 12am at Bar Bleu.